Yesterday was a slow food day, in the sense of a slow news day. Out of eggs and low on milk, we are looking forward to the shipment of food coming today from the co-op. In addition to eggs, milk, and other staples, I ordered 10 pounds of Roma tomatoes to make more sauce. Mmm! While I really liked the recipe I used last weekend for a roasted tomato sauce, I welcome any recipe suggestions…perhaps one recently tried by certain lovely readers in California? 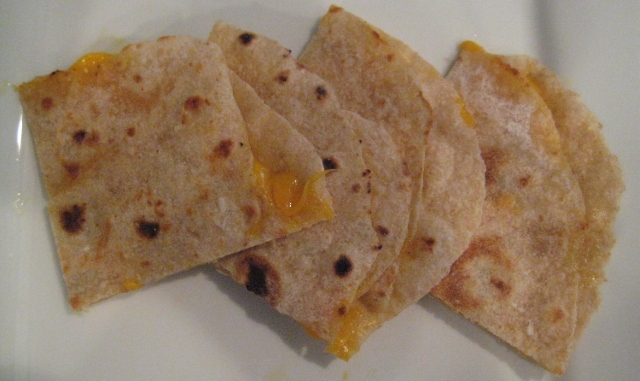 Dinner last night was simple – quesadillas from Ashe county cheese and homemade tortillas. I like this recipe as it does not use lard and works with whole wheat or white flour or a combination of the two. I made the tortillas early in the week and stored them in the freezer – just for a low-cooking day like yesterday!